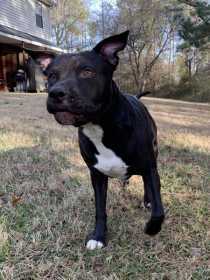 He is a male pit bull who is very friendly. His eyes are a rust/brown color . He is black with white down his chest, neck, and on all of his paws except his right back one. He is about 60 lbs and he is 2 years old.